Canada rate of 12.9 excludes Quebec. Source: CICH graphic created using data adapted from Schroth RJ, Quinonez C, Shwart L, Wagar B. Treating early childhood caries under general anesthesia: a national review of Canadian data. J Can Dent Assoc. 2016; 82:g20. 1Schroth RJ, Quinonez C, Shwart L, Wagar B. 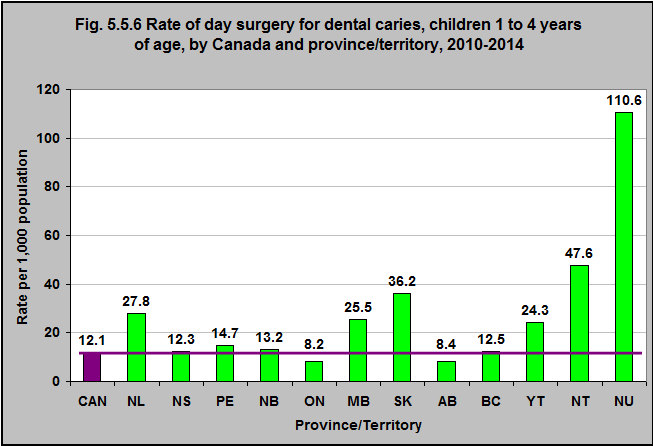 Treating early childhood caries under general anesthesia: a national review of Canadian data. J Can Dent Assoc. 2016; 82:g20.